A real champion of colours. Dignity’s classic feel makes it enormously popular. Although relatively subtle, it’s still bold enough to give a room character. It’s on our showroom walls and customers always ask what it is. It all depends what surface you are painting onto. For example, if you are painting onto wood that has already been primed, then you don’t need a primer. You can just apply your top coats. If you are painting directly onto wood, you will need a primer. In layman’s terms, a primer ensures that the paint has a surface to stick onto. We sell Grepp. It is not our own brand but it is our brand of choice. It’s a fast-drying white pigmented Primer. A two in one undercoat and primer, it acts as a sealant and stain block and provides excellent adhesion to most surfaces. Only your decorator will be able to give you an accurate idea as no two rooms are the same shape. Door sizes, skirtings, fitted furniture and ceiling heights come in all different sizes, all of which need to be considered. As well, colour matters. If you are painting over a dark coloured paint in a lighter colour, you are likely to need more coats. Or if you have high ceilings, you will need more paint than you perhaps realise for your walls. You can use our paint calculator which can give you a steer. Or you can use this table as a rough guide. 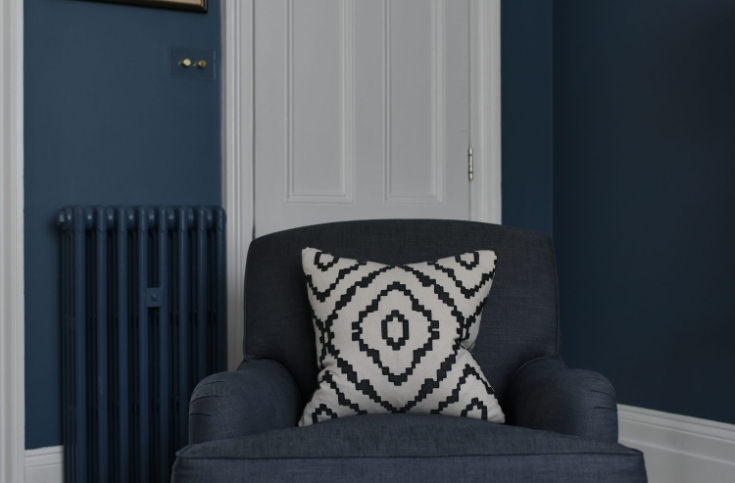 You can order paint via our website or by phoning the showroom direct and we do offer a free click and collect service. We can deliver paint to anywhere in the UK. For overseas delivery, please get in touch. As a small company, we are not yet at the stage of being able to offer our customers free delivery. We work hard however to get the best delivery prices for you. All our prices are inclusive of VAT and promise a 3-5 delivery although we have known customers to get their paint earlier than this. All orders received by 11.30 am will be sent out that same day. All orders after 11.30 will be sent out the following day. If you need paint urgently, we can arrange for a next day delivery. Again, please just call the showroom and we’ll sort this out for you. Delivery is based on the weight of your paint order which is calculated at check out.